10 quick tips for choosing the right wooden train set for your child. If you’re anything like me, you’re fascinated by wooden trains and your inner child jumps up and down when you see some of the beautiful train sets which you can’t wait to buy for your child. But a quick browse online and your dazzled by the number of different railway sets, fantastic features and varying price tags. Our first rule of thumb for the very young is keep it simple, keep it small and keep it flat. If your child is 12 to 18 months avoid sets with bridges and loose parts and go for something like the BRIO Little Foresters Train Starters Set. It’s simple for little hands to use, inexpensive and a great starter set to add to later. An important thing to remember is that there really is no need to rush or bamboozle your child with too many features too young. They’ll get so much more pleasure if you add accessories and other sets as they grow and develop rather than give them to them all at once. 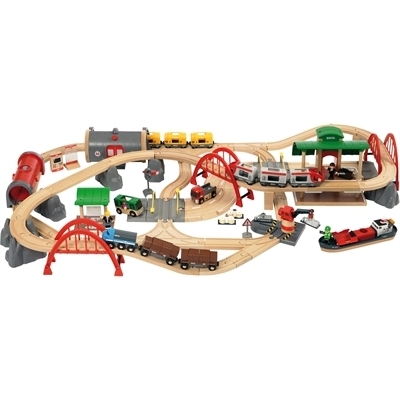 If your child is 2 years or older then the BRIO classic freight train set or figure of 8 set are just that little bit more sophisticated but still easy to set up and very affordable too. 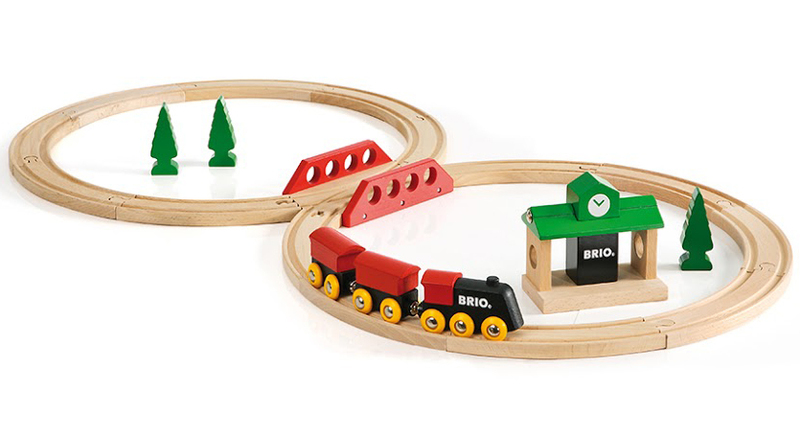 Another great set for beginners of 2 years plus is the BRIO Farm Railway with its integrated farm building or the BRIO Metro set. We find with younger children, that they get so much more out of sets when pieces are attached to the rail rather than loose wooden elements, when the pieces can be easy to knock over or mislay. So your child’s 2, they’ve got a very basic set and you want to add to it? The BRIO magnetic action crossing or bell signal are perfect for the next stage. The crossing shuts once the train passes and the bell rings, both activated by magnets working with the train’s metal wheels. Neither require batteries and they’re perfect for the next level of interactive play and stimulation. 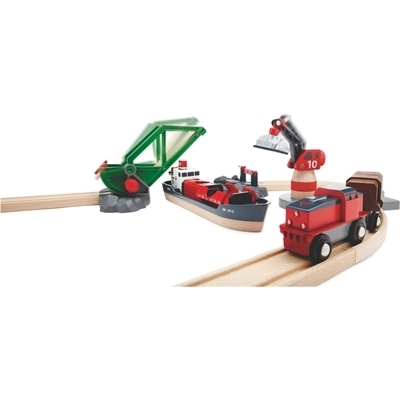 Another great set which is just that little bit more challenging is the BRIO Cargo Harbour set. With its multi function crane, moveable bridge, cargo ship and sliding door boxcar, it has all sorts of clever little stimuli to really engage your child and help develop dexterity and imaginative play. 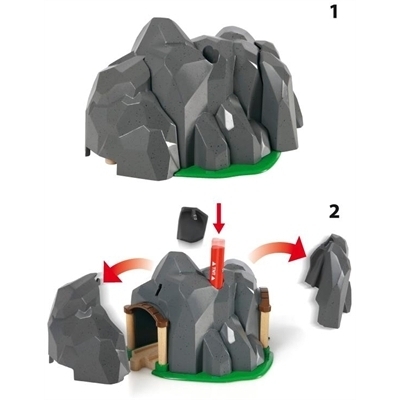 Sets like BRIO’s road repair set, collapsing bridge and dynamite tunnel have great educational value and bring new and clever twists to traditional train set play but they’re probably best if your child is a little bit older, say 3 years plus. So you simply love the deluxe sets? We don’t blame you so why not ask the family to chip in and make it a really special Christmas gift. To get the absolute most out of your toy train sets once you’ve chosen, we find it’s best when the children are very young to set them up on a table or in a quiet corner where your child can keep going back to them without having to set them up from scratch and not push them over by trying to sit in the middle. When they are older let them play on the floor to explore all corners of their imagination and your living room! Don’t forget, these train sets will last for years and you and your children can keep adding to them as your child develops. It’s a great way for family and friends to chip in and get something your child not only really wants but will bring many years of fun. They may even hand them down to your grandchildren! 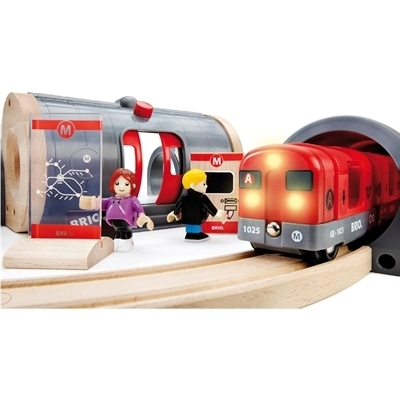 We hope that helped in your quest for the perfect toy train. But if you still have any questions or need any help as you try and choose, we’re always here at The Toadstool and are very happy to help, so why not drop us a line with your queries or just post your own tips for the top train sets you recommend for your tiny ones.